Another 10 Gallon Micro-Reef Page! To skip the babble and see the latest pictures click here! 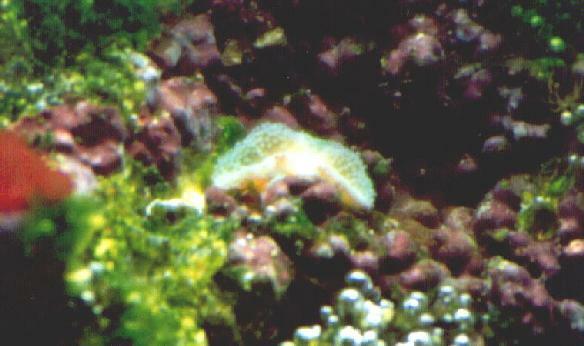 Welcome to yet another page devoted to the keeping of marine fish, invertebrates and macro-algaes in a small aquarium. The intent of this page is to share information and my experiences thus far in the maintainance of a small marine tank, and to show others how it is progressing. The tank, however, is experimental and consequently it is difficult to report all of the details. This is the first draft of the page, and I'll attempt to update it frequently so that you may follow its progress. There are pros and cons to such a small set-up, but financially at least, it is feasible for me to have one this size! February 14, 1998: Although I have attempted to update the most critical changes in the tank, I have not updated any of the pictures. For the most part it appears essentially the same as the pictures show, with the exception of the corals. All in all they are hardly similar to these pictures at all and when I get the opportunity I will try to show the progress of them. I'm not sure if updating the page in the manner I just have is ideal, but I thought I ought to update some of the info in any case. Please let me know if you feel I have omitted information that would be helpful, or how I can improve the page. In the next update I will have some new pictures, and I may just make this page a link on the new to reduce how cluttered it all seems to be getting. The tank is a standard all-glass 10g aquarium, heated, and biologically filtered using a Mini-Aqua Clear (with ultra-grade carbon). The tank is skimmed using the small Lee's counter-current airstone skimmer, and contains a plenum for natural nitrate reduction. Presently, lighting is from a Life-Glo full-spectrum 15w 18" flourescent tube and a 9w 5000K compact flourescent. February 14, 1998: The contents of the tank remain essentially unchanged with the exception of the addition of another mushroom. Although the corals appear excellent by comparison to when I received them, they did seem to suffer some in the transition to distilled water, more so it seems than by the presence of phosphates. In any case, the latest undesirable is hair algae which seems very efficient at out-competing the macros for food. January 26, 1998: Originally started as a fish only tank, decoration included about 6 pounds of dead coral. In December I added 3 lb. of Fiji live rock. The piece I added was of rather poor quality in that the coraline encrusted areas where rather grey looking and no other signs of live were visible. Now, the coraline has become more vivid, and some interesting life has started to emerge, including several species of macro-algae, brown polys, and some Aptasia anemones. The tank also contains an as yet unidentified rock anemone, some pink, purple and white sponges, as well as a medium sized feather duster, a few types of macro algae I have introduced, and an unidentified bright red thing which is growing rapidly (I suspect a macro-algae of some sort). The fish include 2 Green Chromis and a Percula Clown. The tank also sustains a variety of micro-life such as tiny shrimp, worms, and nudibranchs. I've just added my first beginner coral fragments, 1 small mushroom, 2 finger leathers, and a quarter sized ricordia. February 14, 1998: Finally!!! I have reached a situation where the sand bed is doing a job more impressive than I would have imagined. With three fish in there and nitrates steady at 0.2 ppm, I am certain the bed is working well at denitrifying. It also seems to be working well at keeping up phosphates, something I didn't anticipate! However, phosphates are a different matter altogether; I am trying to deal with them through the use of distilled water, calcium dosing and a phosphate sponge. January 26, 1998: The plenum has been here since the beginning, however, I added the final (I hope) layers of sand to it in December. The void space is 1 1/2", on which 3" of crushed coral/sand sits. The sand is supported by 6 PVC 'slices' and a sheet of eggcrate covered by fiberglass screening. The reason I have been adding the sand incrementally is primarily to better judge how the system is working since I do not have an oxygen test kit, and to avoid a Hydrogen Sulfide wipe-out. The goal is to attain areas in the plenum with oxygen levels between 1 and 1.5 ppm, a level which supports denitrifying anoxic bacteria. February 14, 1998: The tank has had some drastic fluctuations since my last report; hopefully they will be for the better. Finally, nitrates have dropped to a fairly low level, especially for a small tank. As tested yesterday, nitrates are at 0.2 ppm, phosphates are at 0.4 ppm and I have started dosing Kalkwasser (Calcium Hydroxide). One of the major changes in the tank has been a drop in pH and Calcium levels, likely due to the switch from tap water to distilled plus the plenum finally kicking in! (a freshly mixed batch of distilled water only gets me a pH reading of about 8.0). Ca is presently 270ppm and pH 8.1. Not nearly high enough in either case, and I expect the dosing of Kalk and Baking Soda will help this. Top off water is now from an IV micro drip with a teaspoon of baking soda and calcium hydroxide dissolved in a gallon of distilled water. The reason for my switch to distilled is primarily because of phosphates in the tap water, which until this point I had not been testing. My goal is to attain a pH of at least 8.4 again and Ca levels of about 450ppm (although I may be willing to surpass that amount since I have heard of no adverse effects to higher levels). I'm not sure, however, what the relationship between total calcium and available cacium is in the tank. If anyone can shed some light on the matter that would be greatly appreciated! January 26, 1998: The tank is maintained with a Specific Gravity of 1.024 at 76 degrees. PH is 8.4, and I'm not sure how hard the water is, but our tap water is very hard. I filter the tap water for mixing and evaporation top up through a Brita water filter. Nitrates are steady at about 7-8ppm, and I don't test for Phosphates or Silicates. I have, however, attempted to recharge an old Phos-Zorb pouch by baking it to burn off the phosphates, and I have yet to see what the results are. As far as dosing Kalkwasser, or adding additional trace elements, I add nothing, primarily because water changes to boost used elements is more economical than dosing is in such a small tank. I am investigating the potential for dripping Kalk near the skimmer intake to precipitate phosphates, but I have not implemented that yet. If you would like to contact me, feel free to e-mail me below, or look me up on IRC, where I usually reside as Saul_ or RbrDucky on #fish and #fishing. I am by no means an expert, but I would be happy to chat with you about my tank set-up or yours. Hopefully, the posting of my experiences provides insight that the 'bullet-proof reef' advocates fail to mention! If you return to the page, try reloading it by hitting Reload on your browser to get any updates I may have done!